Jack Nicholson's portrait of Teamsters Union leader Jimmy Hoffa, as seen through the eyes of his friend Bobby Ciaro (Danny DeVito). 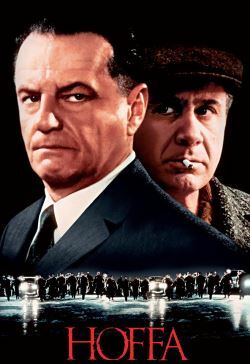 This film follows Hoffa's struggle to shape America's most influential labor union through his countless battles with the RTA. As he fights for workers' rights, Hoffa locks horns with industry management, organized crime and Attorney General Robert Kennedy. In 1975, four years after serving his prison term, Hoffa disappears, in one of America's most fascinating unsolved crime mysteries.